How present are you during this time of year? Are you so busy that you lose touch with the meaning of the season? Are you too stressed out to really enjoy time with your family? Do you struggle to remember what it’s all about? Is it difficult to stay focused on the joy and hope of the season? Would you like to enjoy yourself and your family more? 1) Set your intention. 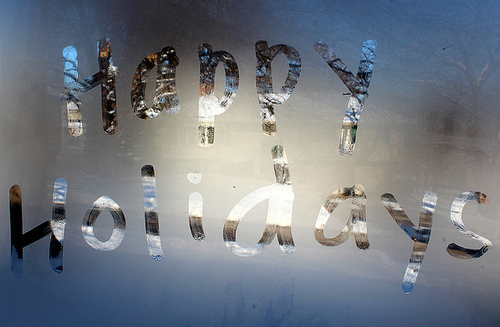 What is the meaning of the holiday season for you? Are religious or family traditions important to you? Do you enjoy cooking, baking, decorating. Is it important to buy gifts for family and friends? Do you want to be more present with your loved ones and enjoy focused quality time with them? Would you like some time to yourself? If you could create your ideal holiday season what would it look like? Write down what you want to focus on this season. 2) Stop and take a deep breath. Breathe gently in through your nose to the count of four: 1-2-3-4. Now breathe slowly out through your mouth to the count of eight, blowing gently like blowing a bubble: 1-2-3-4-5-6-7-8. Do it again, breathing in peace and relaxation and breathing out anything that needs to go. As you do this tune in to your body and your thoughts and feelings about the meaning of this season for you. Remember warm and happy times from previous holidays. Let go of the busy clatter in your mind and focus your thoughts on what’s important to you about the holidays. 3) Pay attention. Focus on what you want to create for the holiday season. Make a list of things to do and then cut the list in half. Pace yourself. Rest when you are tired. Ask for help when you need it. Remind yourself to pay attention to your intention you set in step one and make sure that your activities are consistent with it. 4) Notice when you are off track and focus back on your intention. If you find yourself rushing around, staying up late, eating too much, ignoring your partner or kids, stop, take a breath, remind yourself of your intention and steer back on course. What do you need to change in order to be more present? 5) Repeat steps 2-4. Periodically take a deep breath and check in to see how you are doing. Pay attention to how your thoughts, feelings and actions align with your intention. Adjust as needed. Repeat this process over and over again throughout the season. 6) Reflect. Take a few minutes to stop and think about how things are going. Notice how you feel and how this is the same or different from last year. Notice what is great about this holiday season. Think about changes you might like to make for next year. Gallery | This entry was posted in Life Coaching and tagged burnaby, christmas, holiday stress, hypnotherapy, hypnotist, kamloops, kelowna, kitsilano, law of attraction, life coaching, north vancouver, power of now, sonny rosati, stress, vancouver, west vancouver. Bookmark the permalink.